A great book is like a feast. We love to concoct stories from food but what about making food from some of our favourite stories? - Take a generous helping of Ian McEwan and leave to marinate overnight. - Add some Sebastian Faulks to a pan and sauté on a high heat. - Mix in a dollop of Louis de Bernieres (don’t stint) and shavings of Mark Haddon and bring to the boil. 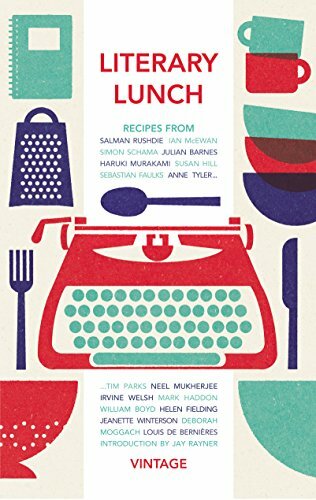 - Add a rounded teaspoon of Anne Tyler, a smidgen of Neel Mukherjee and a pinch of Julian Barnes, according to taste. You may also wish to add a sprinkling of Salman Rushdie to add some heat. - Reduce the mixture down and add a splash of Irvine Welsh, skimming off excess expletives. - Remove from the heat and add essence of Haruki Murakami slowly, drop by drop, making sure to mix in thoroughly. - Meanwhile, using a rich brandy or calvados, flambé thinly sliced extracts of Simon Schama – to avoid a scorching, avert face and be prepared for a flare of potentially large flames. - Finally, bring all the elements together and plate up with a dash of Jeanette Winterson and garnish with a sprig pf Helen Fielding. Enjoy with a full-bodied red wine.